I grew up in a loving home but I was confused with my identity in Christ. When I was five years old, I was sexually abused. Ever since I experienced this abuse, shame and fear controlled my life. During junior high school I ran on the track and cross country team. I wanted to excel in this sport and set very high standards for myself. I could not live up to these standards and thought I was a failure. I developed an eating disorder which lasted seven years. When I was sixteen years old, I entered into an unstable and emotionally abusive relationship that left me confused and insecure. I fell into a deep pit of depression and it felt like the whole world caved in. I isolated myself and lost touch with the joys of life. I continued to struggle with my haunting past and decided to seek counseling through my church. I found out about Mercy Ministries through my counselor and a former Mercy graduate. I started the application process, but during this time I started living my life in the fast lane. I tried to fill the voids in my life by partying, drinking, and getting involved in unhealthy relationships. I ended up in an unhealthy sexual relationship and when my boyfriend broke up with me I was crushed. Shortly after, I lost a dear friend and thought, "I can't live with this pain anymore!” I attempted to end my life, but by the grace of God I was not successful. As I lay in the hospital bed, my family stayed by my side and insisted I fight for my life. After a couple of unsuccessful visits to treatment centers, I was tired and burnt out. Mercy called me to tell me they had a place for me at the end of my senior year, and I was finally ready to change my life. As I walked through the doors of Mercy Ministries, God showed me His love and forgiveness. While in the program, He began to break down the walls of fear, pride and anger. Now I'm walking out my faith and giving God all the glory for my transformation. At the present time, I'm working for Lakewood Church in the book store and attending the College of Biblical Studies in Houston, Texas. I plan to pursue a degree in biblical counseling. I'm hoping that one day I will be on staff with Mercy Ministries here in Houston. I thank God, Lakewood Church and Mercy Ministries for restoring my life. When I was 15 years old, I was molested. Throughout my life I was abused, raped and manipulated. I developed an eating disorder and became depressed and suicidal. After several attempts to take my own life, I desperately wanted freedom from the pain. I found out about Mercy Ministries through an old friend. I knew I needed help, but at the same time, I would not admit that I had a problem. I realized that I had a choice- I could either choose to attempt suicide once again or I could apply to Mercy Ministries. I chose Mercy. While at Mercy, God has given me complete restoration. He has cleansed me from the inside out. Psalm 45:11 says, “The king is enthralled by your beauty; honor Him, for He is your Lord.” This verse spoke to my heart and has changed the way I view and carry myself. My passion and dreams for my life have been restored. After Mercy, I plan to go to the Lost Valley Ranch in Colorado. I want to work there for a while. In the fall of next year, I hope to go to Moody Bible College. I would like to write books and minister to youth and adults. I want other girls who are struggling to know that there is hope. Our Father can heal any amount of pain. Mercy is a foundation that restores life and brings hope to hurting young women. Before I came to Mercy, I had been sexually, emotionally and physically abused. This abuse caused me great anguish and confusion. I tried to numb the pain by living a life of self-destructive behavior. I developed an eating disorder and even studied the occult. I became consumed with depression and practiced self-harm. Eventually, I tried to take my own life. After four failed suicide attempts, I realized I needed help. My parents found out about Mercy Ministries on the Internet and told me about the program. My mom and I attended Mercy’s 25th Anniversary Conference. When I heard the graduates share their testimonies about their experiences at Mercy, I became hopeful that the program could do the same for me. I had nowhere else to go and Mercy seemed like my last resort. While at Mercy, God gave me hope and a future. I have a new love for Him and His creation because I learned that He first loved me. He showed me that I am His daughter and He is the vindicator of my pain. I have a new perspective on life and He has transformed me. The program was hard at times, but it is completely worth it. Mercy Ministries changed my heart and my life. After Mercy, I am going home to live with my family. I plan to finish high school and get involved at a local church. Eventually, I would like to go to school and study Psychology. Before Mercy, I was depressed, suicidal and had an eating disorder. My issues just went from one extreme to the next. I had refused to go to counseling on my own, but I knew if I didn’t seek help, my life would continue to spiral out of control. I decided to apply to Mercy hoping to find real freedom. While at Mercy, God has completely captivated my heart. He has given me more joy than I have ever known. He continues to bless my life. My goals and desires have changed for the better. Now I have a positive outlook on life and can see beyond myself. Now that I have graduated from the program, I plan to attend Moody Bible Institute in Chicago and study music ministry. 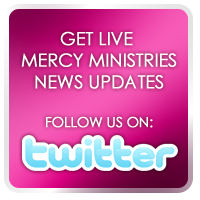 Mercy has greatly impacted my life and I give God all the glory, honor and praise for restoring my life. When I was 15 years old, I was raped. Then I became involved in an abusive and controlling relationship with an older man. I believed the lies that Satan put in my head, and I was completely broken. I continued to get involved in unhealthy relationships. I became depressed, and I had no desire for life and no joy for anything. While I have been at Mercy Ministries, God has changed my whole outlook on life. He has restored my joy and my dreams. Now I seek Him every day and have a relationship with the one who saved me from destruction. All of the lies I once believed have been replaced with His truth about me. Now I plan to move home and live with my parents. In June of 2009, I plan to go back to Kenya, where I grew up, and do missions work. Eventually I would like to attend Capernwray Bible College in New Zealand. Congratulations, Girls, on completing the program. We are so proud of you and we look forward to seeing what God has in store for your lives! !